I have wanted a weather vane with a horse for many years. Now I won't be able to sleep tonight for thinking about the possibilities. My absolute favorite among these is the eagle--you have understandably kept the best for yourself. It's funny about architectural eagles, after a certain date they are the worst of 'phony-colonial', but the early ones have quality, history, dignity and the American ethos on their side. I have an old photo of the Eagle House in Haverhill, which boasts a large 3-D eagle, although not a weather vane. 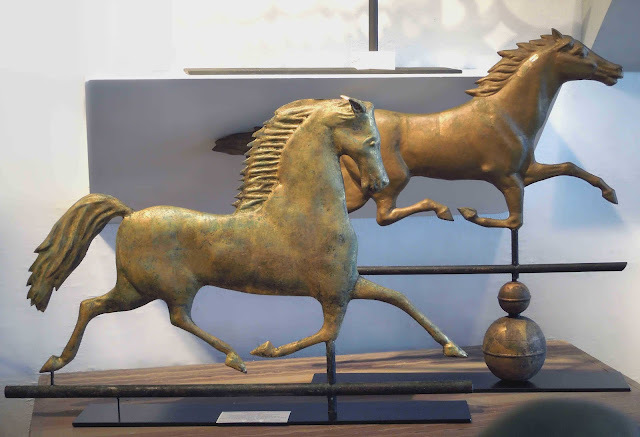 A minor advantage of weather vanes is that most are mainly two-dimensional, which prevents their taking up too much room, and helps them go against walls. Finally, their weathered appearance let them fit right in with the Loi Thai look. Great post! I love horses and cows and have them in my home too! I am always looking forward to your posts, they are beautiful! This is a wonderfully interesting post and I thoroughly enjoyed every single word and photograph! Thank you for sharing these wonderful images and a little bit of history as well. Loi, these are their own beautiful art form! Are they made of any specific metal(s), or was it whatever the maker chose? I need a Boomer -vane :) Did they ever use dogs on vanes? This was a nice break from concrete staining ( front steps), thanks! Susan, I'll bet there are dog weather vanes out there. A pointer of some sort would make the perfect weather vane, wouldn't it? Now I feel I must search for one! Love the patina on the table in Michelle's dining room. And the photograph of your Eagle on the pedestal table is perfection! Thanks for this lovely post. I love this post. I have seen the running horses before, but I never realized they were weather vanes. How cool! I have to say that the gilded cow and eagle are two of my favorites. The photos in your post are amazing. What a great post Loi. Thank you. Oh Loi what a wonderful post! I love your Eagle! I never thought much about weather vanes before. You have opened up a whole new world to me. I love the horses... They would fit in any decor! I am visiting your blog for the first time and just wanted to let you know how much I enjoyed it! This post is amazing. I'm happy to have such an interesting and beautiful new read! Blackhawk ownes my heart. xxxooo Sunshine! What lovely photos and interesting post! I love folk art and feel I will now keep my eyes open for a weather vane to keep our horse dinner bell company! This is fascinating, Loi! I'm used to seeing the arrows. How interesting to see the farm animals! Once again, a beautiful post, both photographically and textually, so full of information - tidbits that add flair to the subject matter. What elegant rooms, and the antiques shop display is perfect! We also have a weather vane. It's actually on the roof, doing its job, but would love to have it displayed in the house, keeping company with all the other black iron roosters! Fantatstic post Mr Loi, I've been up and down looking at every piece. Dexter does look magnificent between your baluster lamps. One of my favourites is the leaping stag. I can imagine that once you find one beautiful weathervane that you become hooked. You seldom see weather vanes in England, a bit ironic seeing as we get so much 'weather'. I adore your beautiful Eagle Loi, a very handsome chap, looking wonderful in your lovely home. 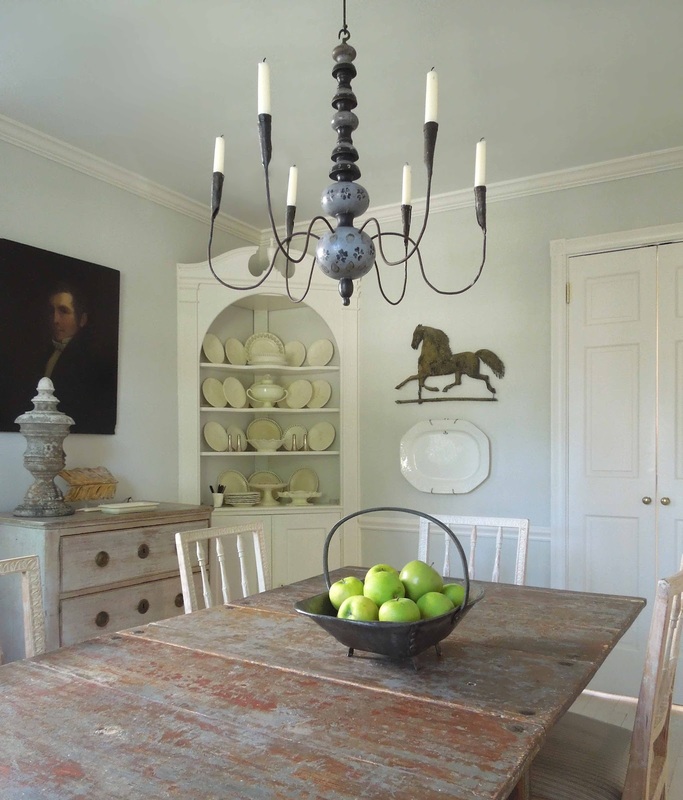 Michelle's dining room is to die for, elegant and timeless. I've always wanted one. But it would be hard to pick just one. I'm sure they were used country wide but they seem very New England to me. These are all beautiful examples. The pig is interesting because of the little visible squares. Not sure if it was built that way or if it might have been gold leafed and those are the leaf sheets. Loi, Great post. I love the the horses, but that giant pig weathervane is pretty fantastic. Thanks for sharing your sources. I think the weathervane, although it comes from a folk art tradition has a modern sensibility. Oh Loi, your posts continue to please. The rustic goodness, the soothing neutrals, the unique pieces of history. 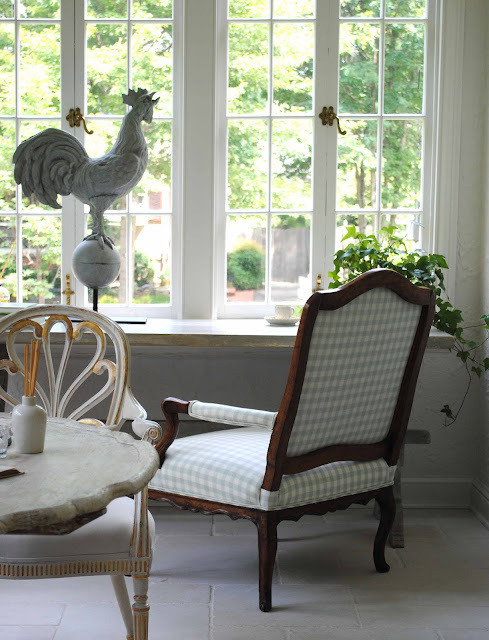 Wish you were my neighbor...I'd always have you over for tea....and a quick design consult....I adore Michelle's dining room. Great post. Thanks. 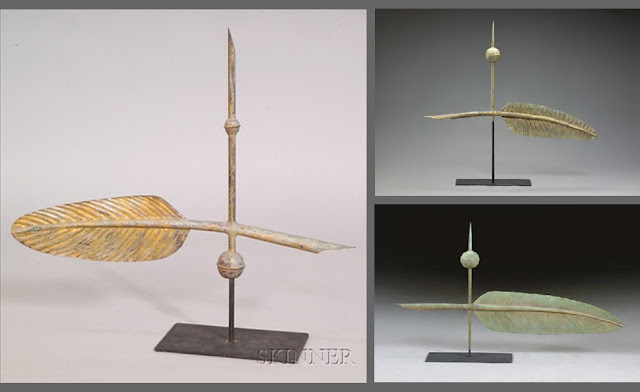 Hi Loi, What a wonderful post - I love seeing all the different weathervane forms. The quills are fascinating; I had never seen those before. The sculptural quality of some vanes make them seem to have been intended for interior display, that they were actually made to be outside and exposed to the elements is a testament to the makers who must now be considered artists. ps. Your clients' homes are beautiful. Now I really miss the weather vane from atop of our house. We used to have a cow weather vane that was original to our home but was taken down and ruined by an ice storm. You've shown some beautiful examples Loi and just goes to show that they go in any setting, lovely post. Now I have something new to keep my eye out for when shopping. :) I truly love every one of these you have shown! They make such an impact in the rooms and are so beautiful! I am especially drawn to the leaping stag. What fine examples of weathervanes, Loi! Your eagle weathervane is quite a find. Love the gilding on the examples you've shown. I've never seen anything like the quills and the Michelle's cow weathervane is so detailed. It looks great on the mantel with the gilded mirror. Loi, they are like pieces of art. I have always loved the look of them when there used as decor. There not very easy to find in So. Calif.
We had never thought to use weathervanes as decorative items before now. But, the wind is set for change! The weathervanes you show all look so perfectly at home in their surroundings and do add enormous interest to the interior decoration scheme. Your own eagle looks magnificent. The perfect 'eye catcher' as you have placed it. We shall copy, unmercifully!!! Loi, This is a magnificent post. As always, I learned volumes. The American Eagle that you have is exquisite. I wonder what museums are interested in it. I hope that you are having a wonderful, relaxing Sunday. Thank you for my antiques lesson of the month. Here in SC we don't see many weather vanes and there are few collectors so today's post was all new for me. I do think you just inspired my holiday card.....I love the silhouette and graphic appeal. color me smitten, loi. i will be on the watch now. that little gilded cow speaks to me. i love the education i receive here on your blog--i have a passion for learning, and it's so great to broaden my horizons! smiles to you from sunny arizona! Great to see the weather vanes in so many different settings. I love the eagle best- a very strong piece. Truly love the history and artistic appeal of the weather vane. This post is a beauty and shares not only some wonderful examples but is very informative. Your eagle is outstanding! I am always excited to read another of your posts Loi....thanks for sharing all you do. I love the horse weather vanes. They are all so beautiful! I had no idea what treasures these are!!! I now have a whole new appreciation and now I WANT ONE!!! You're dangerous Loi, that's why you're so good at what you do!! Loved this post... you're brilliant! Loi, this is a beautiful post. I am partial to the horses, but I really love your eagle weather vane. Earlier, Susan asked if they make any dog vanes, and I thought, being the dog-lover I am, that there must be some out there. A pointer would make a great weather vane. I may have to do some Internet searching! All stunning - how does one choose a favorite? I do love your eagle! 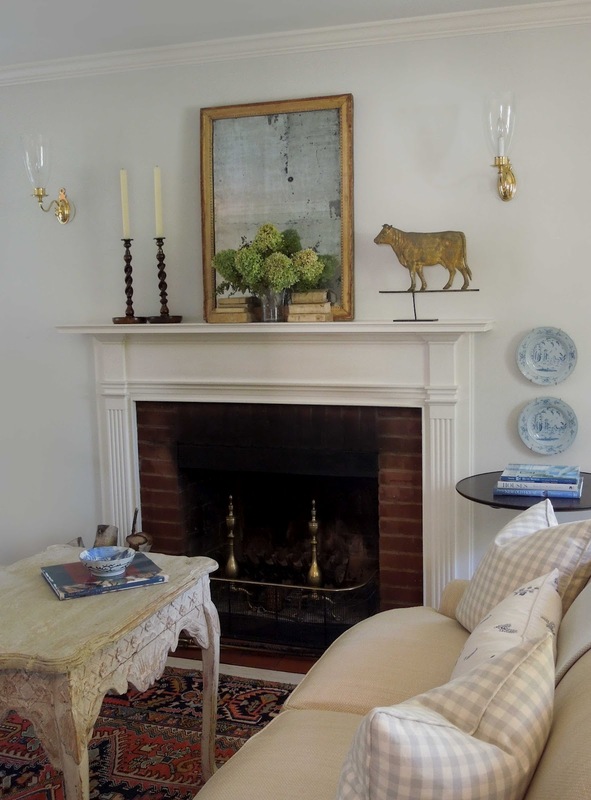 They are such charming additions to these beautifully curated rooms and become brilliant focal points. 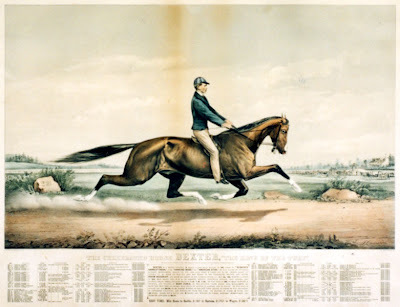 I have a fondness for horses and must really keep an eye out for one of these. A beautiful post and such lovely photos, as ever. Oh, I really need to do a Maine trip! Glad you had fun there and found many interesting things. I have always loved weather vanes, a friend owns a rider behind a harnessed horse. The horses hold great appeal to me but I would love a pointer equally. I confess, the little feather was charming as well. I always enjoy your posts. I will check out the homes you've linked us to. Hey Loi! Oh I'm so with you on weather vanes! They are art and that's sad about the bullet holes. These are all beautiful! Your eagle is breathtaking!! It's wonderful to see these incredibly lovely displays. Awesome Loi, thank you! It's a wonder to me that such handsome weather vanes are still to be found on the market! They are each so beautiful in their own way that I'd have a hard time choosing a favorite, but your eagle would probably be my choice — small wonder. It was great that you could match Lori's Dexter to the Currier & Ives print! Gorgeous insight to weather vanes, we have a horse - displayed in my horse loving daughter's room. You have shared beautifull ones here, thank you! I have always loved weathervanes, especially antique ones like these. I love the eagle and the dancing stag. Beautiful photography as usual Loi! 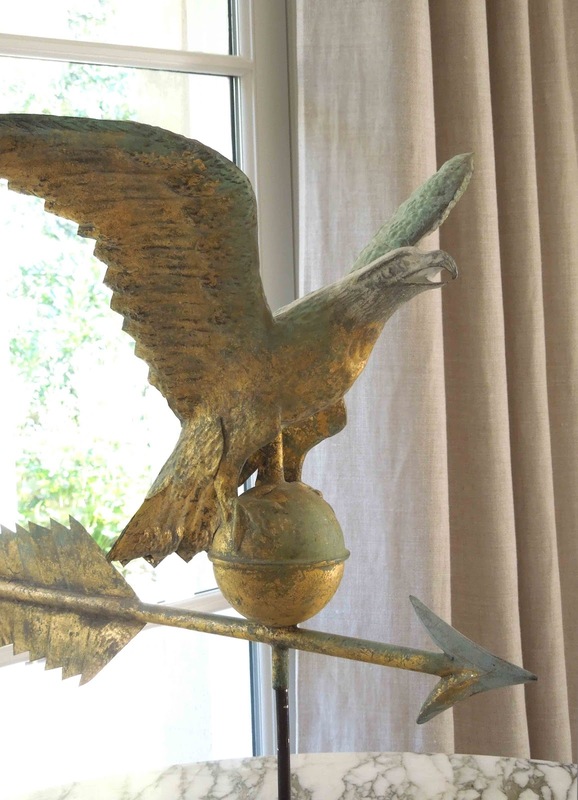 These weathervanes are wonderful examples, especially your eagle. My husband and I bought a 19th century horse weathervane at auction in 1980 and installed it on a barn we built. It looked wonderful. When I sold the house in 2009, I left the vane on the barn. I seriously regret that decision now. What a wonderful topic for a post! As First Day Of Fall: Autumnal Equinox Arrives On September 22nd the winds of change approach. I love weather vanes and all their mystery if you don't know anything about them. They are making a huge comeback and I'm seeing them in gardens and on the exteriors of home more often. A touch of the past is always a great beginning for a new look in the future. Love it Loi! What an amazing variety of weather vanes! I had no idea of the range. Loi, your spaces are so serene, and I love the way you use elements like weather vanes into the mix! It's a little surprise, which is always nice. Incredible weather vanes, Loi!!! I do love these and I love the rooms with the high contrast. I'm always attracted to it. I love them all, but I must say I'm really drawn to the horses! They look as if they could just take off running. Wishing you a beautiful week....whatever the weather! 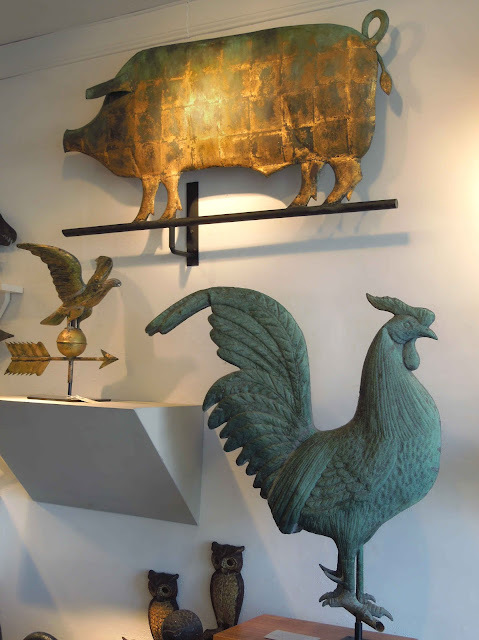 The weather vanes are very cool and I loved seeing photos of different ways to use them inside the home. They remind me of many of the unusual roof top finials Tom spied while visiting France. There were so many different styles and I'm sure there's a great deal of history associated with those also. Unfortunately we didn't find any at any of the fairs or shops we frequented:(. 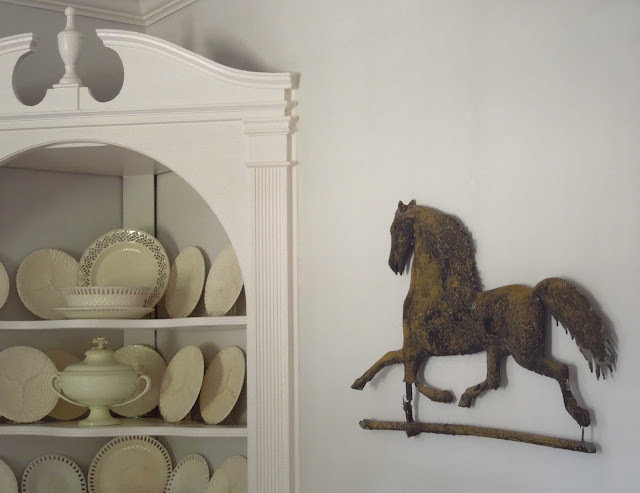 I adore these antique vanes in homes...especially the farm animals. We have geese right now (came with the house), but with all the horse farms around, I was wanting a horse...until I saw that amazing cow! One of those please! Didn't you love Wiscasset? Quite the town for how tiny it is. I always stop there on our way to Rockport/Camden. Brilliant! I love these weather van inspiration in your post. Gotta have this in my bucket. Got my eye on your next posts. Oh. My. Gosh. You find the most beautiful and unique things, Loi. I am in love with the eagle and horses!! Weather vanes add such beauty and movement to any space. Thank you so much for sharing these beauties. So fantastic! We have a few weather vanes that have become part of our family. They bring such charm and whimsy into a space. What a beautiful story, and images. I need a horse weathervane and have thought about them for years. I love the eagle in your home, and the quill vane is especially unique. I see these in any style home. I hope you have a great week Loi, and that you are loving this fall weather! We need to catch up soon, so I'll ring you. Have a great week. I love weather vanes and have been looking for one to place on the roof of my cottage. These are lovely. Love these, so charming. 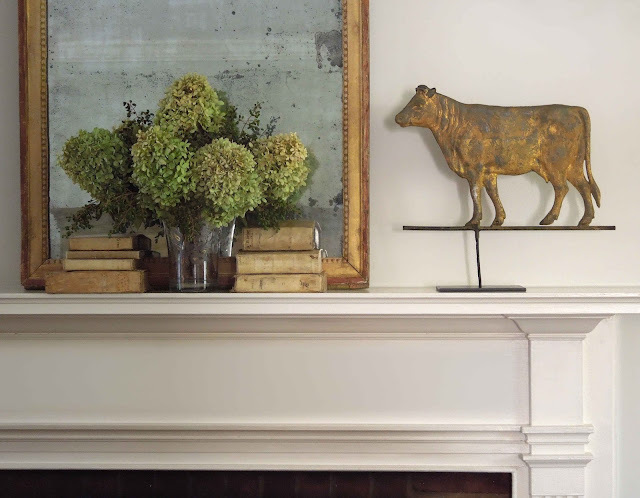 I pinned the cow on the mantle when you posted about your friends pretty home. They really are the feature of each room, they attract the eye in a way that art on the wall does not. I like how they represent the artistry and beauty of country life. The little feather is so sweet and the eagle in your home is spectacular. Jerry Lauren's apartment is quite beautiful. Love the clean white decor to show off the weather vanes. My parents home has an antique swan decoy similar to his on the Parsons table that is even prettier, I know my brothers and I will all want it one day, will have to figure that one out! I admire it every time I am in their home. Beautiful post as always, get excited when there is a Loi post in my Google Reader! Hi Loi, again sharing beauty and knowledge.....I have learned so much since finding your blog! 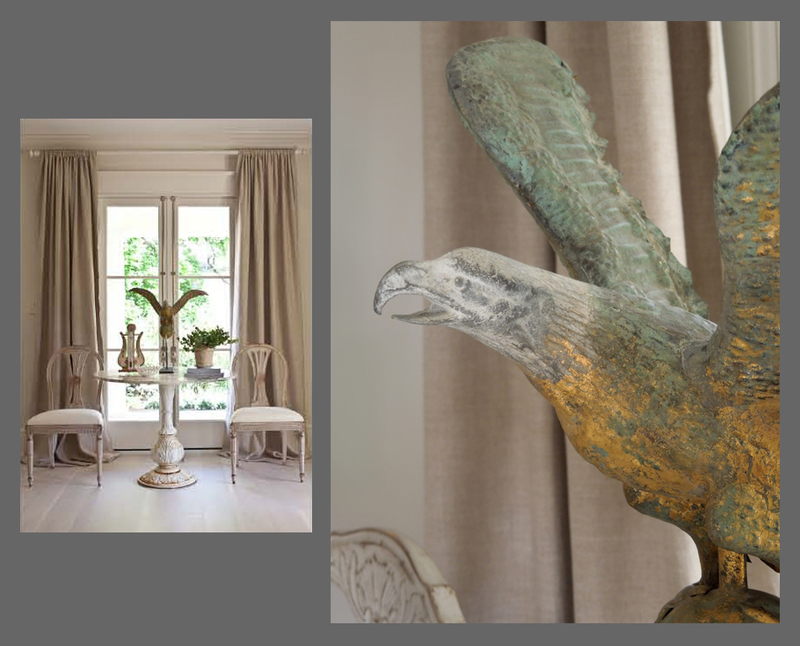 My favourite is the eagle in your home...truly exceptional, and perfectly placed. Thank you, Loi, for this wonderful and truly special post! wow, each and every one of these weather vanes are unique. Weather vanes have always fascinated me. Loi, lovely post. I ( and many other, I hear) have been having blog problems over the last few days. I could see your post title, but then when I tried to pull it up...it just showed your last post. Glad to be back to normal. Whatever that is!!! I LOVE weather vanes, and they seem to be able to adapt to any decor. From country to traditional, to everything in between. So many beautiful pictures you offered us here, to set our little minds reeling with all the possibilities. Loi I think this might be your best post yet. So many unique ways to display weather vanes. I have a couple in my closet that I need to be more creative about displaying. I love that eagle on the round table. It looks so regal in that spot. 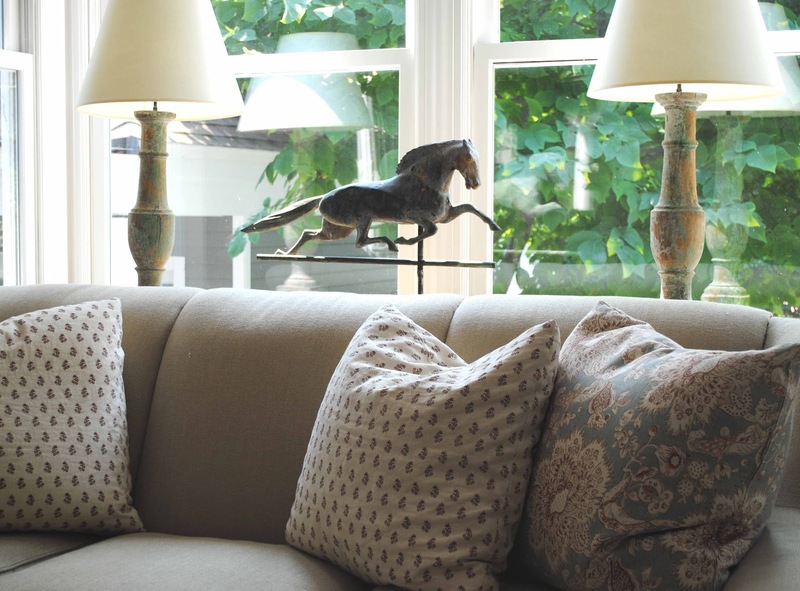 You have such a great eye...love the one behind the sofa and Candice Bergen's dining room! Fabulous post! I love bringing the outdoors inside! 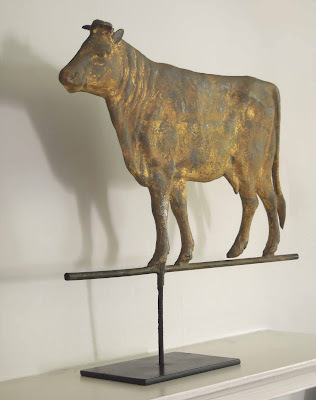 Really fabulous post with so many great pieces displayed with your own great style:-) I love the cows and the golden pig. Hope you are keeping great! (- hit publish by mistake! - wasn't finished!) too many good ones to choose from here. Don't see that many here in Ireland :( love the pig - very cute! and your eagle is AMAZING - such presence!! Loi, I like you love weathervanes...and lightening rods! These are such great photos in one place. They are about to make me late for a meeting! Thanks for the visits...I can just see you doing the stroll...did you ever have an afro? I did, but not on purpose! Blogger was being a pill yesterday and acting crazy, so I hope this isn't a repeat comment. 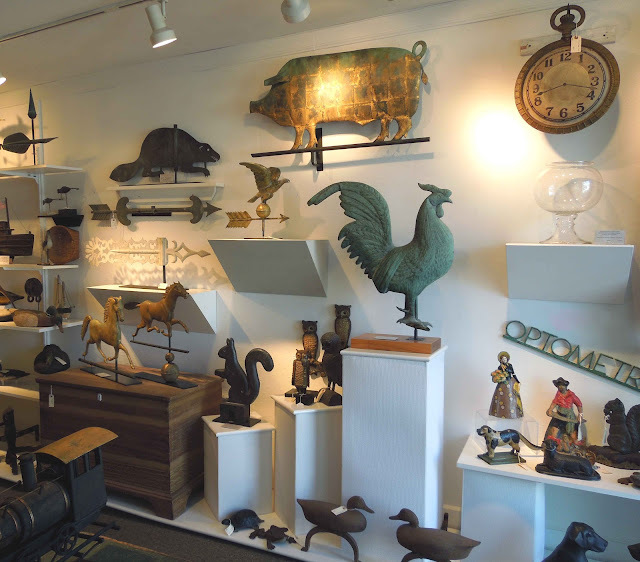 I love weather vanes and folk art in general! That eagle vane is simply gorgeous, as is the one you have in your shop which I've been eyeing for quite some time! Well well aren't you nice. Just giving us all something else to want...first clocks and now weather vanes......it never ends does it? Loi, I adore weathervanes!I have a large leaping rabbit (or hare) weathervane. The smaller ones are so intriguing!! 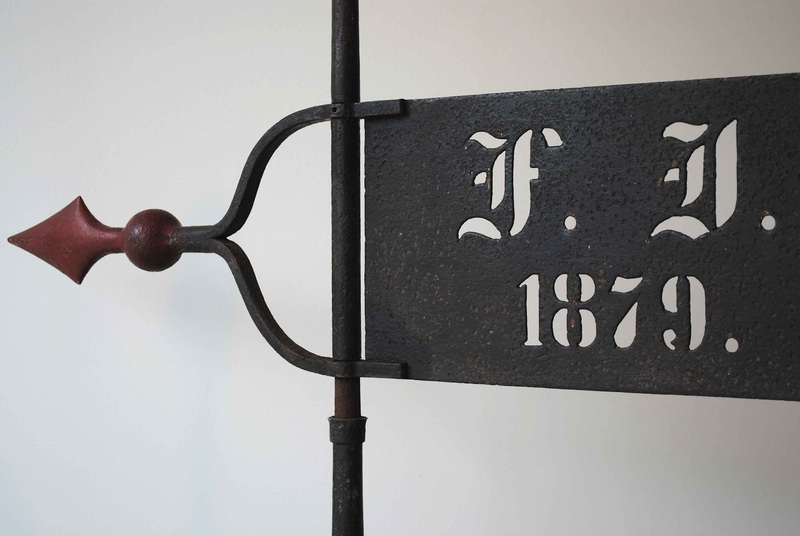 Loi, I love the bucolic feel of the old weather vanes. The bannerette is to die for as is your photography! How I have not seen this beautiful post is beyond me! Except for being way too busy! I have collected weathervanes over the years and you just rekindled that love I have for them! I truly love going to shows where you will see the more primitive pieces and folksy pieces like these weathervanes. It makes me wish I was at the Heart of Country show right now! If you know of any great shows in your area I would love to know about them! thanks so much for your kind words today! I will definitely show pics of Hannah's room when it is finished! Have a great day! Hello Loi, another great post. 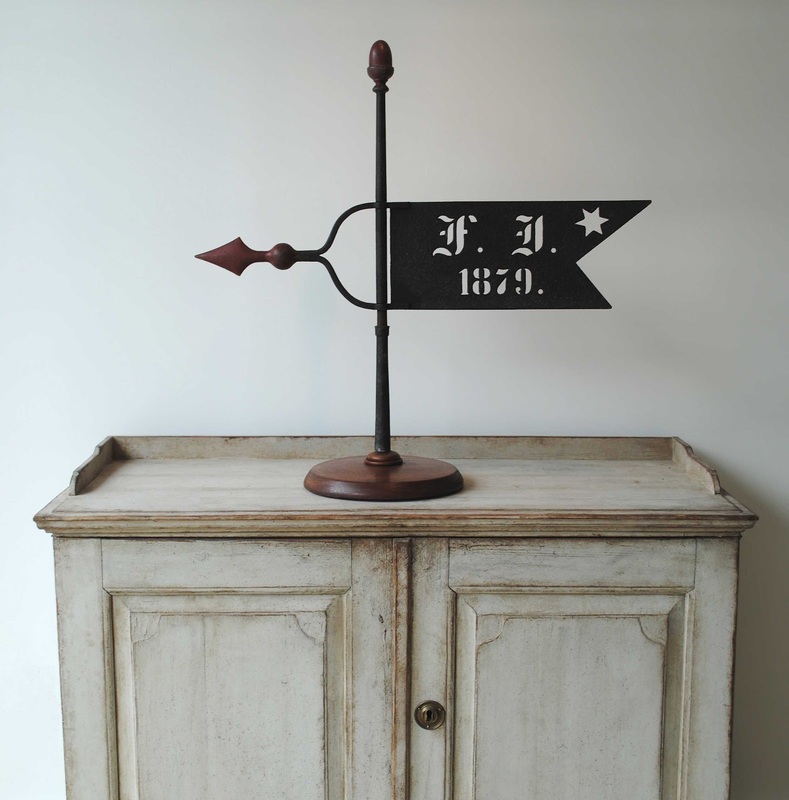 I have seen these used en masse on walls but I like the appeal of a lone vane on the mantel. It is perfect for a country house. Actually what I would like to build is a tack room with a display of antique vanes. I think tack rooms are so often overlooked as a utility space but I think some equine vanes would be a little country and a little cheeky. What great inspiration for something a little "quirky" in a space. My weathervane atop my cupola on my home (the angel gabriel) was a housewarming gift from my mother. Che bel post,Loi!... meravigliosi ambienti, dettagli ricchi di gran fascino,sono un sogno! Weather vanes.. I did not heard of them before...they are soooo beautiful and the patina is just stunning! I love horses and antique horse decorations.. so beautiful! Thanks for sharing these beautiful images. Weather vanes are so cool. Loved them in the Lauren home, and particularly like them atop buildings. Guess their value is too high now to be floating on high. Thanks for the great images, as usual. I don't know which I'm in love with more - the rotund pig or the American gilded cow - now that's a sentence that I would never have anticipated coming out of my mouth - lol! What an interesting study of weathervanes. I love the tonal contrast in Michelle's kitchen, I also love her mantle. As gorgeous as the golden cow is, that painting is what really catches my eye, they are perfect combined. Do you have any recommendations for bases for weathervanes? I actually have a couple from France that I had planned to put on buildings, but never got around to it. Where do you suggest I look to find people/ places to create a base for these beauties? I just found your blog and love it!! Greetings from Bangkok. Do you or your forebears hail from here? I do like weathervanes and have been watching them at auctions for some time. Some achieve rather staggering prices. 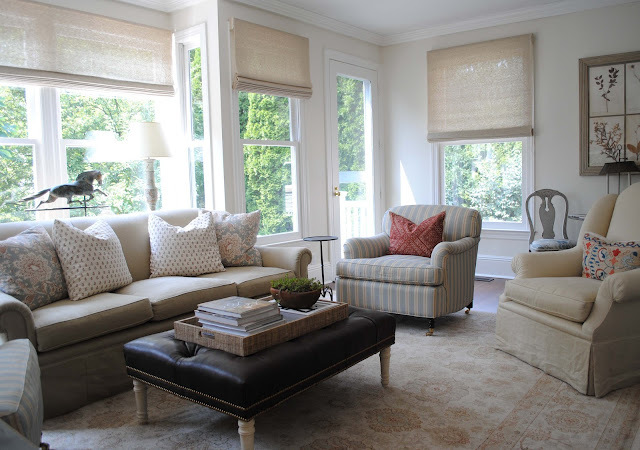 Unfortunately I don't think they would fit into my design scheme, and they are really best suited to the beach house environment, such as those you show of Candice Bergen's Hamptons house. 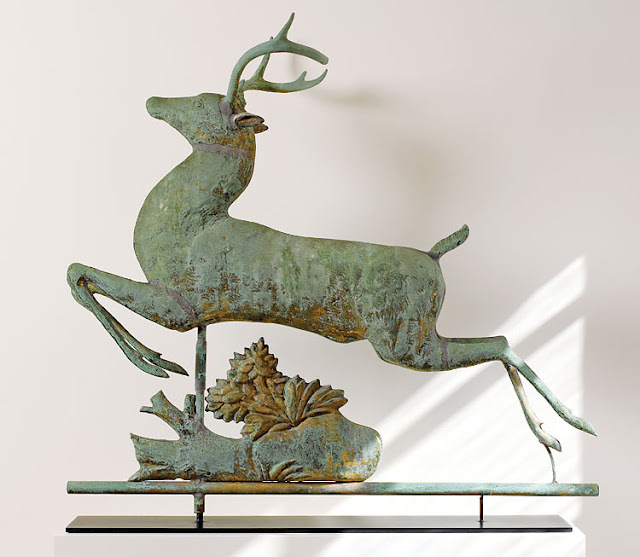 I have something similar to a weathervane on my balcony, covering an uplight, and therefore casting an unusual backlit shadow on the wall, and that is of a reindeer, designed as a Christmas decoration by a friend in Hong Kong, with its antlers having holders for candles. It's a WONDERFUL post .....thanks for sharing this with us. My two favorites are the Federal Eagle and the Stag. As always, your posts are the best of the best. These weather vanes are absolutely gorgeous! I especially love the horses. I love The best of the best! All of these are beautiful and add a special touch to the room... Loved learning about Dexter! He is stunning...especially centered behind the sofa in front of the window like so. Thanks Loi! Lindo os cata ventos. Tenha um cata-galo. Me deste uma ideia maravilhosa, comprei para colocar no galpão e nunca coloquei. Agora vou colocar na sala de enfeite. Obrigada pela dica. informative and full of lovely photos. and adds a touch of country and whimsy to any space. I do not know why or how I missed this! I love weather vanes, although I do not own any I appreciate their beauty and history. The leaping stag is my favorite of all that you have featured. I love old and new weather vanes. It is hard to pick a favorite. Could not get my iPad to let me write more. I really enjoy your blog and work. Thanks for sharing. Thanks for sharing! Beautiful blog! How could I find out more about my horse & sulky weathervane? I'd love to display it and also know more about it. It came from my husband's great-grandmother's farm in Maine!